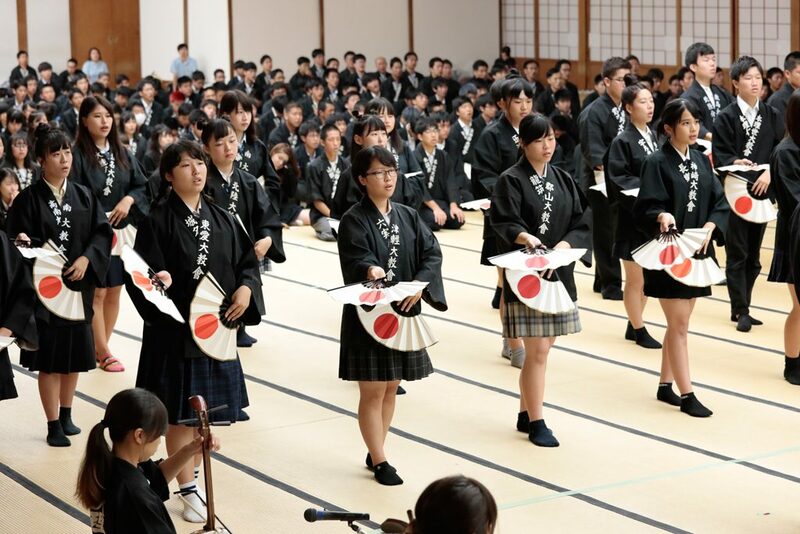 The High School Division of the Students Training Course was held at the Home of the Parent between August 9 and 15 with a total of 858 participants from all parts of Japan. The students studied the teachings through lectures and workshops, as well as by spending time together at the dorm for one week. On June 14, the day before the week-long program ended, a practice service was held for participants who are high school seniors. In the lead-up to the practice service, lectures and service practices had been conducted to help the students learn not only the hand movements but the importance of the service. One of the seniors, Hiroki Ono (not his real name), was a first-timer to this program. From the age of six, he was raised at a Tenrikyo church as a foster child but had not really thought very much about faith. However, after listening to a lecture on the theme of the “Joyous Life,” he learned of the importance of doing the service in unity of mind with others and not just individually. He later said that he would like to perform the service with his family and people at his church, uniting their hearts as one. After the closing ceremony, the participants, with their completion certificates in hand, made their way home, promising one another to meet again in Jiba.